What’s in a name? Perhaps more accurately, what’s in a name relative to other devices on the market? You see, the name Robust doesn’t quite fit the APV we’re talking about here. When I think robust, big and powerful come to mind. While the L-Rider Robust that I just received from Vaporcigzz has an acceptable amount of power, big is exactly what it is not. Relative to a standard electronic cigarette or even an eGo, I suppose you could call it robust, but it’s diminutive size compared to other variable voltage devices on the market is what make the Robust so attractive. The Robust is a very small variable voltage device. The Robust has an attractive and functional design, with a body that comes in a variety of colors with chrome end caps. A blue backlit LED display is framed top and bottom by the power-down/power-up buttons and activation button respectively. The LED is easy to read, but the placement of the adjusting buttons make it a little awkward to both press the buttons and see the display at the same time. The display remains lit for a few seconds, however, so it is still easy to see the settings after adjusting the voltage. The activation button is nicely sized and easy to press with a subdued click feedback. The bottom cap screws on smoothly and has a vent hole for added battery safety. The top cap has a deep well around the 510 connector that makes the device compatible with many eGo atomizers and cartomizers as well as providing a well to catch any leaks. In the center of that 510 connector is the positive post which is spring loaded, ensuring a good connection. The unit comes packaged in a simple box with attractive graphics. Included are the device itself and a simple manual that explains the functions. Batteries, charger and atomizer are purchased separately. At just 115mm or 4-1/4 inches long, the L-Rider Robust is only slightly longer than an eGo-C Twist battery. It is also just a little wider and at just under 2 oz. with the battery installed, only slightly heavier than the Twist. Comparisons to the Twist are unavoidable due to the similar size of the two devices, but the Robust incorporates features that are more likely to be found in much larger devices like the Lavatube or VMax. The LED display and button functionality is the main advantage that the Robust has over other small variable voltage devices. The LED normally displays the current output settings when adjustments are made with either the “-” or “+” buttons in .1 volt increments. There are other functions as well, though. Pressing the “+” button for about 3 seconds displays the remaining battery voltage and 5 quick presses of the activation button display the atomizer resistance. Holding the “-” button for around 6 second turns the unit off or back on again. Replaceable batteries are the other advantage of the Robust over the Twist. The device is powered by a single 14500 battery that is removed for charging. 14500s are similar in size to a typical AA battery and allow for the small design. Replaceable batteries make it less expensive and space consuming to carry spares. We did notice output differences between batteries, with AW high drain batteries performing significantly better. The L-Rider Robust comes from the same manufacturer that brought us the Lavatube and voltage performance is quite similar. that is to say that it performs perfectly up to a point. Output voltage matches the set voltage, but there seems to be a limit of about 10 watts, which is not unusual for many mass produced devices. In practice, this means that with a low resistance 1.7ohm cartomizer attached, the output is limited to about 4 volts regardless of what the device is set at. This is about the same as the limitation on other devices in this price range like the eGo Twist or Lavatube, but lower than most more expensive devices. With small battery size also comes shorter battery life and the Robust with its 14500 is no exception to the rule. Under moderate use, the battery lasted less than a day on a single charge, with performance dropping off as the battery fell below 3.7v. Spare batteries are a necessity. 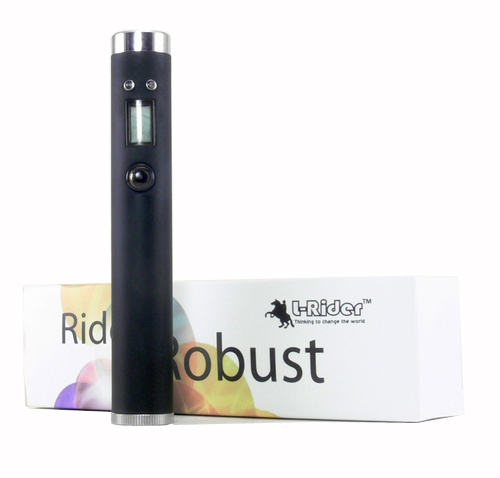 The new Robust from L-Rider is a well put together device that offers variable voltage and added features in a small and attractive package. The size, ability to check battery voltage and on/off feature make it a great device to throw in a pocket or purse when heading out of the house. Replaceable batteries ensure that it will be economical in the long run. Voltage output is about average, but adequate to provide a good vaping experience. Battery life is somewhat short, as expected from the relatively small batteries. In total, this is a great device for its size and at just under $50 may be a perfect next step for those wanting to move up from entry level electronic cigarettes but not quite ready for a large device. Note: The device tested here was received at no cost from Vaporcigzz.com for the purposes of this review. As always, we try hard not to let that get in the way of an honest review.